Beautiful and rare 20th century, French Jacques Adnet clock gueridon from the 1950s around the theme of Hunting Court, a Horse and his saddle, a dog and a hunting Horn. The clock is working with 15 jewels. Switzerland mecanism. 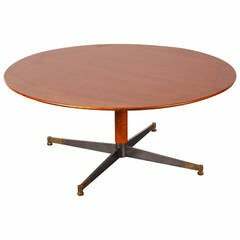 This very nice gueridon is made with gilded brass and Leather. This is a rare piece and with very good quality. 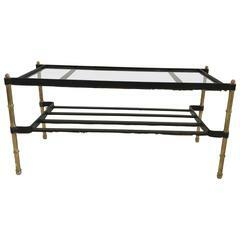 Coffee table, structure in faux bamboo and metal covered in black leather, designed by Jacques Adnet. Size: 94 x 46 x H 42 cm. Chrome structure with a black leather top and three drawers underneath.